Many of you here have been asking me about the photo herein which "I saw myself in a World's Fair photo. I will try to list all the pertinent facts I remember about visiting the Fair. 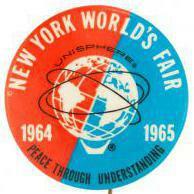 I went to the 1965-1965 World's Fair in New York when I was 13 years old (12yrs9mos) with my parents and my sister in 1965. It was during the summer so I didn't miss any school. I have vivid memories of seeing the Pieta in the Vatican Pavilion, "It's a Small World" at the Pepsi Pavilion, "Futurama" at the GM Pavilion, "Magic Skyway" at the Ford Pavilion, "Carousel of Progress" at the GE Pavilion and of course many others. My Dad wasn't photographing the Fair, so I didn't have any of those "get in front of this (pavilion/fountain), it'll make a nice picture" experiences that other families had. Space Park was another stop at the Fair. I remember distinctly my Dad and I walking to Space Park, with my Mom and Sis heading to Clairol and the Better Living Center exhibit, even though it would put us at opposite ends of the Fair. My Dad had no interest in rockets, and if I wasn't interested in space, we probably would have skipped it. 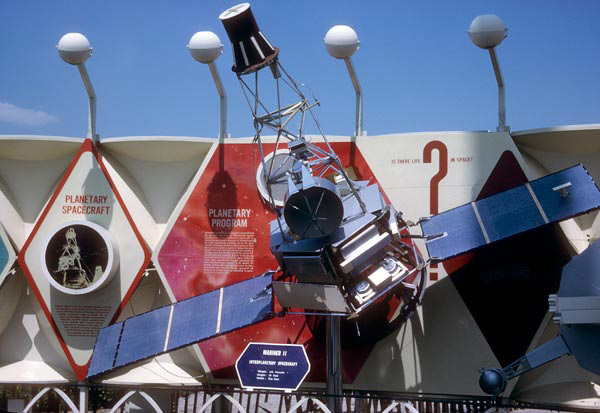 But with space and NASA being my "jam", we walked in Space Park. 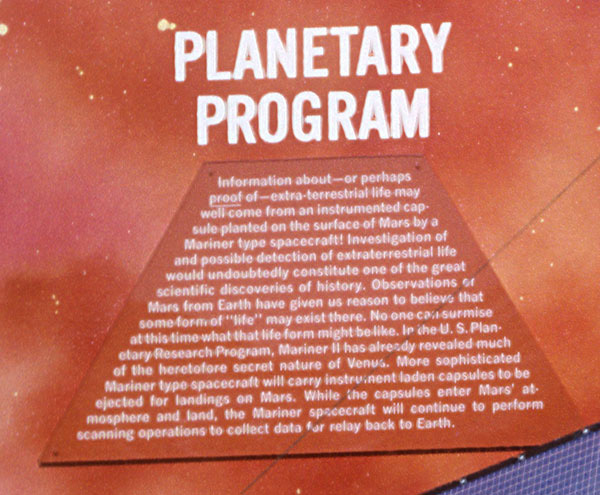 My Dad was going to stand by the Saturn V and have a smoke, while I perused the exhibits. 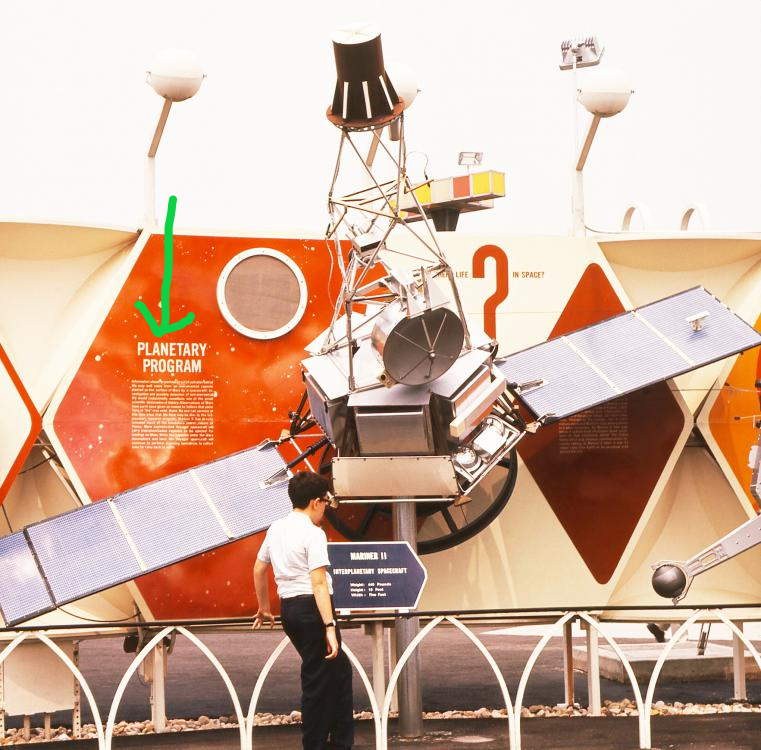 I am alone in the photo (no parents or siblings seen), no souvenirs (my Dad always said to wait until the end of the day), and here I am looking down (not up) reading the information on the plaque. Clothing: Not quite of the age where I could pick out my own clothing, my Mom always dressed me in a white shirt and black pants (colors not allowed). I would rectify this in later years. Eyeglasses: I started wearing eyeglasses in the 6th grade so naturally I would be wearing them here. Watch: I am left handed, and in going to New York for the second time (Freedomland was the first), I was told to put my wallet in my front pocket instead of the usual back left pocket (because, I was told, of pickpockets). This created a problem, having my watch (normally on my left hand) catching on the lip of my front pocket while reaching for my wallet or change. So I switched wearing my watch from my left hand to my right hand while I was in New York. Head: Well the hair color is correct and I'd recognize the back of my head anywhere. It may not be distinctive, but to me it is. I've been searching for family photographs which show the back of my head (at this age), but for some reason I'm always facing the camera (imagine that). Ray, the fact that you recognize yourself automatically makes this one of the most important in my collection. It's right up there with the day I stumbled upon a group of managers from my first employer in Northern Kentucky. For some unknown reason I didn't take their picture. Wow excellent! Good advice about the wallet too. There must be some photos of me out there someplace too, because i was at the Fair for most days having worked there in 64 and 65, always on the 3 to midnight shift. I know somebody has a photo of me leaning out of my Greyhound bus window in 65 looking, as i imagined, like Ralph Cramden from The Honeymooners. Someone i knew snapped that picture and said he'd send me a copy, but he didn't and i don't even remember who he was now. As it is i only have one single photo of myself at the Fair, and it's out of focus, driving my Tour A GAR in 1964 (i drove the gar in 64 and the bus in 65). I still have my id cards from both years, but there were no photos on id cards back then. Ralph, thanks for the kind words. Now you have a name to go with the picture. Larry, as I stated in other posts, there are pictures of us at the Fair that we don't even know about. They were taken with us not knowing we were being photographed. They're sitting on some shelf or in some closet of someone's home. The only thing remaining is to find them. Too bad your friend didn't send you the "Ralph Cramden" photo. If I were documenting (photographing) the whole trip, I'd have a photo of the bus driver. Heck, I'd have had a "starting out" photo of my family getting in the car in Massachusetts. Here are some other random facts I remembered about the New York World's Fair. I don't remember seeing any Greyhound Escorters, but my whole family enjoyed riding on the Glide-A-Ride. The GE Carousel Of Progress rotated clockwise. The Fair was not crowded, there were lines, but they were short ones. The NY visit: The whole family went to see the play, "Barefoot in the Park". What make me remember this it that one of the actor or actress leads was performed by their understudy. This upset my Mom for some reason. I'm trying to put together all of these facts to narrow down when exactly I was at the Fair. 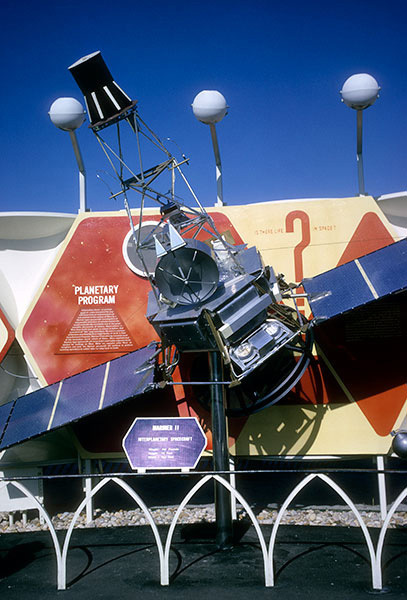 For example, does anyone have the listing of the photos displayed on top of the Kodak Pavilion? And how often were they changed? I've searched other photos looking for the family, but alas, to no avail. My Dad did buy me the U.S. Royal Tire Ferris Wheel toy (I believe he paid $9.95 for it), but like all my other memorabilia, it burned in a house fire. No records have been found as to what pictures were on Kodak for any specific dates. I wrote to Kodak a few years ago and they barely knew what I was talking about. "The Fair was not crowded, there were lines, but they were short ones. " The final week sure was the exception. It was wild. People got the idea that this was their last chance to go and they went! Are there daily attendance figures anyplace? I remember the last day. Greyhound, where worked, was besieged. They were moving us drivers around from place to place. I remember one driver named Kovite. They were driving him someplace perched on the back of a lone GAR engine that one of the bosses was driving. I yelled at him, "See ya, Kovite! ", and he waved back, but, like most of my fellow employees at the Fair, I never saw him again. I did keep in touch with some of them though, and some of them even turned up in unexpected places. When the Fair was going I caught a glimpse of a guy who I believed to be my funny friend from my earlier Navy days. I think he was working at the Fair too, but I was driving and didn't get to approach him. Some of the fair workers followed fairs around and had worked at the Seattle fair and then later in Montreal. Sort of like carnies.
" I don't remember seeing any Greyhound Escorters, but my whole family enjoyed riding on the Glide-A-Ride. " Oh, you enjoyed it huh? It must not have been mine then. But seriously I gave a pretty funny tour, if you like infantile 3 stooge humor that is. I mostly ignored the script they gave us and had fun doing my own thing. Twice I was approached by radio station owners or managers who asked me to come to their radio station for a tryout. Both times I put their cards in my uniform shirt and then forgot about it and turned it in at the end of my shift. Guess it wasn't meant to be... but... Yo, Adrian, I coulda been a contenduh! I am, however, still plagued with guilt for the ridiculously horrible high speed tour I gave that family from England who bugged me by climbing on my gar right before losing time, just them, and I had to give them the whole tour, but I did it at 60 miles an hour rapid fire talking. I wish I could find them and give them their money back. I wish I had done it then when the angry father came over to me and cursed me. I wish I had taken my own money out and said, "You are right, sir. I was a cad and a bounder. Why do I always think g of what ishould have done fifty years too late? Almost 54 actually. Did someone ask for attendance figures? Well here are the daily counts for both seasons with running totals for each season and both seasons. The yellow and green highlighted counts for each year indicate the lowest and highest attendance days respectively. This information was copied verbatim from an official Fair Corporation document. Larry, a bounder and a cad are the same thing, according the my dictionary. However, in terms of quantum electrodynamics, bounder has a mass of 100 mega-electron volts and a spin of negative one-half, while cad emits an electron and an anti-neutrino when bombarded with high energy sheep dung. That's a critical distinction, which the British probably understand better than the Americans. And I thought a bounder was the Australian marsupial version of a cad. You learn something new every day! You're thinking of kangaroos. Kangaroos are mythical creatures that fancifully live on a large south sea island and move along by jumping. Look at the bright side, Larry. You did give them something. A "memory". I asked Ralph for any kind of information on this photo. He said he didn't have anything else to offer. I've been wading through these forums and posts for any other information I could find (like a shot of the family in passing), but I haven't found anything else yet. This photo was definitely taken in 1965. A signage change from 1964 to 1965. So the picture was definitely taken in 1965. I wish to thank all those who have done the research and posted these pictures which have aided in my search. Now, on to more browsing. 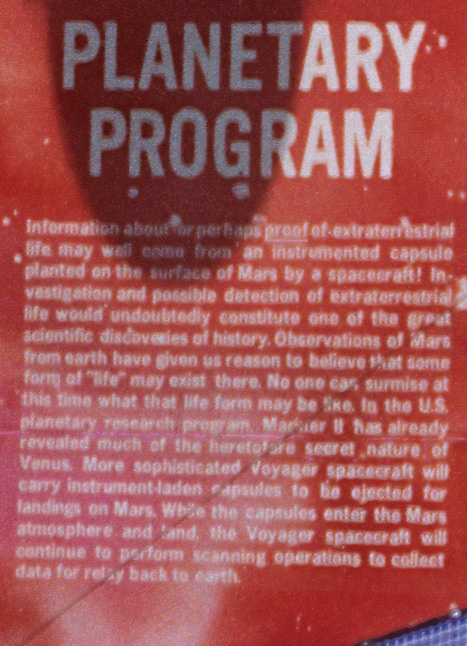 The 1964 version has a typo. I can see one reason why they updated it. The play, "Barefoot in the Park" starred Elizabeth Ashley and Robert Redford. Maybe that's why my Mom was upset. "Look at the bright side, Larry. You did give them something. A "memory". Yeah, Sunguar, i did. Very commendable on my part actually. Regular normal speed tours are a dime a dozen. How many people get to take one in a GAR tram making the tight turns st 50 mph doing wheelies, with a combo GAR race track driver and fast talking expert making every boring WF comment he's paid to make and talking it at 60 mph besides! I never thought of it that way before. I should have charged that bunch double! Maybe now, after 54 years have elapsed, they can even laugh about it a little. After the tour was over the father aproached me and said, "You f'g cheated us! ", or robbed us, or something. I remember he pronounced the "ing" distinctly which is something New Yorkers don't do. We say the word (woid) with an "in" at the end. You think about things !ike that at critical moments when you don't know what's coming next. Oddly enough he wasn't the one who pulled the big knife on me at the Fair. That was someone else, another disgruntled passenger. I'm sure there laughing now. And you should laugh a lot when you remember this. Memories aren't a dime a dozen. BTW, Larry, there's a Greyhound Bus Driver's Jacket for sale on eBay now, if you like to relive old times. All you need is a steering wheel, and you can sit in a chair and...…..…..nevermind. ...make goofy noises with my mouth - quack quack quack, quack quack quack quack quack quack quack...go greyhound and leave the driving to us! ...and pretend I'm driving through a balmy summer night by multicolored fountains and pavilions and dense crowds of happy and nice people and it's 1964 again and I'm 21 again! About ten years ago we - Ray Dashner and a lot of the WF guys here - were at Al Fisher's house in Hollywood, Calif. He had a WF museum in his house, including a Greyhound drivers jacket which i tried on, but it was much too small for me.